Tubes are designed for routine use in immunohematology testing and viral marker testing in screening and clinical laboratories. VACUETTE® tubes are manufactured from virtually unbreakable PET plastic. These clear tubes are supplied with non-ridged pull caps that feature an exterior color-coded ring to indicate either the additive used or draw volume. A black ring indicates standard tubes, a yellow/gold ring indicates the inclusion of a separation gel, and a white ring indicates a tube designed to accommodate pediatric draw. Tubes equipped with a gel separator contain a barrier gel in the base of the tube. During centrifugation, this gel forms a stable barrier between the serum and the blood cells, separating the serum from fibrin and cells. 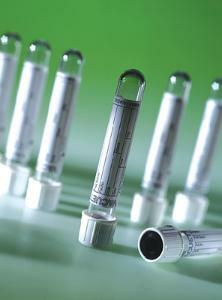 These tubes are particularly effective in therapeutic drug monitoring testing. Standard tubes are also available with no additive.